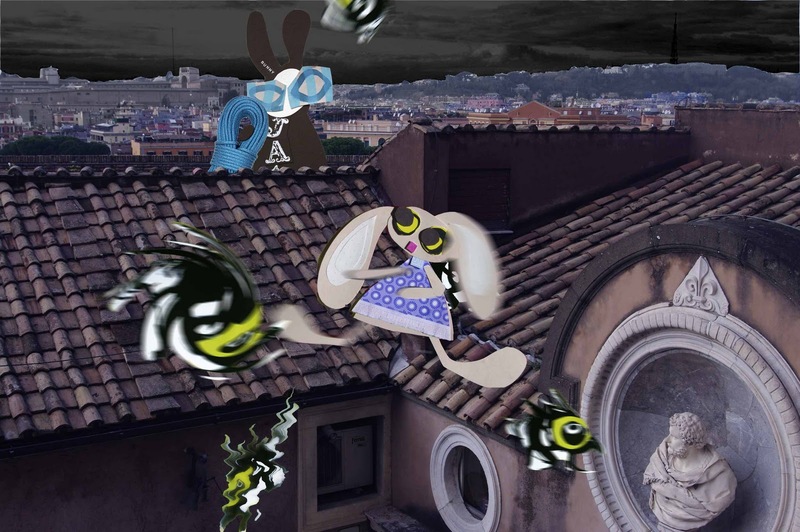 The castle was dim in the moonless night as the Wabbit climbed to the roof. "Hard work, hard work" puffed the Wabbit as he reached the top and put his rope down. He was just thinking about a short rest when he heard a sharp whack. The Wabbit dodged as a Skuttle whizzed past his head. He peered over the roof and saw Lapinette's foot blur. With a piercing squeal, another Skuttle somersaulted to the courtyard below. "Something in the air tonight?" quipped the Wabbit and he sat back for a better view. Lapinette jumped and quickly disposed of smaller Skuttle. "Relax your paw a bit and let it go heavy," advised the Wabbit and studied a book that he kept in his fur. Lapinette kicked one more Skuttle and pushed yet another from the roof. "Shall I make you a salad sandwich?" asked Lapinette with sarcasm as she whirled around. "I only just had a snack," said the Wabbit in a matter-of-fact voice. "Do you need a helping paw?" "Oh, I'm quite happy," said Lapinette, "but where are the other Skuttles?" "Having a signature cocktail," replied the Wabbit. Suddenly there was a boom and the whole castle shuddered. Lapinette stamped on the last Skuttle and turned questioningly to the Wabbit. "Indigestion?" said the Wabbit.